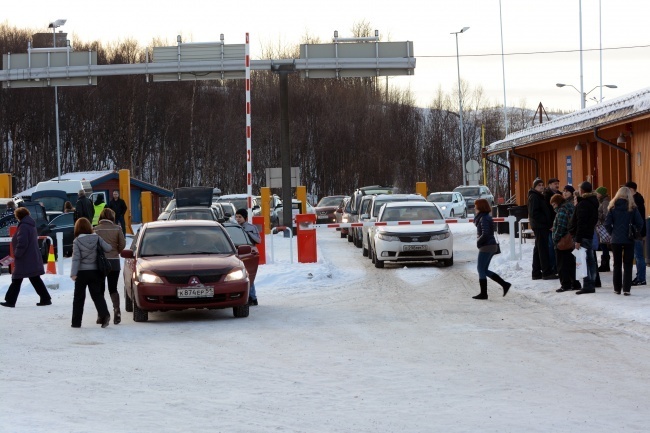 Chief of Police at Norway's border checkpoint to Russia, Stein Kristian Hansen, counts less travellers than last year, but there are still many more than before visa-freedom was introduced in the Norwegian-Russian border area. The Norwegian police at Storskog counted 18,271 border crossings in March. That is down 12,8 percent year-on-year, says Stein Kristian Hansen in an e-mail to the Barents Observer. Hansen is Chief of Storskog border checkpoint. Traffic over the Norwegian-Russian border has gradually declined since the ruble collapse in December 2014. Last year, traffic was down 23,5 percent compared with 2014 and so far this year 8,14 percent. Border-crossings are still 5,000 higher for March compared with March 2011, the year before Norway and Russian introduced visa free travel for residents living within a distance of 30 kilometres from the border. That counts for the citizens in Kirkenes, Nikel and Zapolyarny.